Buffalo Stu is a creature created by Genetech Laboratories by Doctor Feinstein under the supervision of Crawfish Kettlehorn (who would later become the Scourge). 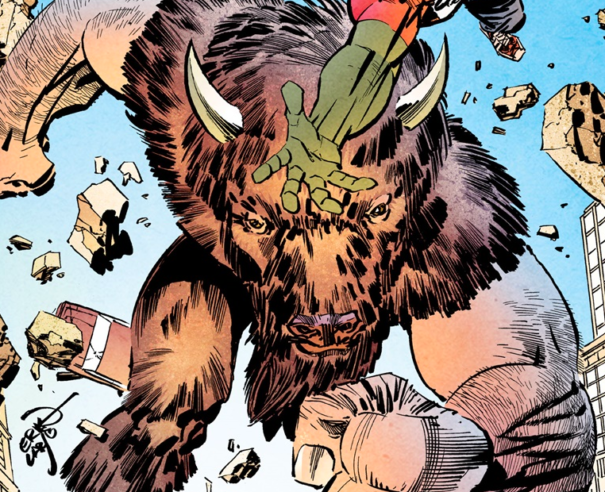 Genetech’s experiments turned Stuart from a Buffalo to a humanoid creature with Buffalo features. Doctor Feinstein told Stuart about the laboratory’s euthanasia of other humanoid experiments, causing him to get extremely upset. In a fit of rage Stuart accidentally hits Doctor Feinstein and kills her. He breaks out of the laboratory and goes on a rampage, but is stopped by Malcolm Dragon.